Facebook Messenger Rolls Out Group Video Chat: The new Group Video Chat feature in Facebook Messenger “makes it simple and seamless to stay connected face-to-face.” With this new feature, users will be able to turn group chats into face-to-face conversations “no matter where [they] are.” iOS users can also add all of the 3D masks that were added to Messenger last week to their videos. Group Video Chat on Facebook Messenger is rolling out now to all Android and iOS devices and the desktop version of Messenger globally. 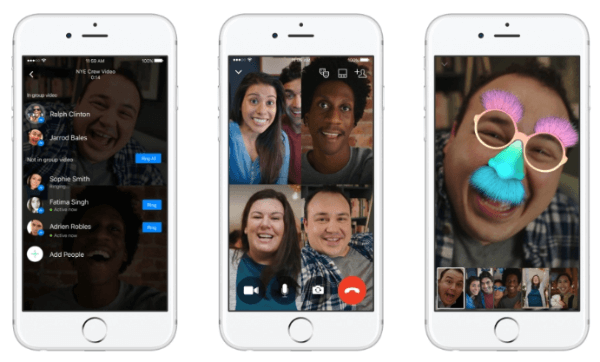 Facebook Messenger rolled out a new Group Video Chat feature on Android, iOS, and the web. Instagram Adds Customizable Stickers to Stories: Instagram introduced “a set of tools to help you add context and creativity to your story: stickers, holiday fun and more.” Once users take a photo or video on Instagram, a new sticker button will appear alongside the text and drawing tools. With a tap, a selection of customizable stickers for the weather, current time, location, and the holidays pops up and can be added to your image or videos. The new customizable stickers are available to all users as part of Instagram version 10.3 for both iOS and Android. Facebook is currently testing Live Audio with a select number of partners such as BBC World Service, LBC, Harper Collins, and authors Adam Grant and Britt Bennett. The network plans to make Live Audio “more broadly available to publishers and people” by earlier next year. Facebook introduced a new way to go live on Facebook with Live Audio. Twitter Fixes Reporting Error for Video Ad Metrics: Business Insider reports that “a bug in a recent version of Twitter’s Android app inflated video advertising metrics by as much as 35%.” Twitter proactively informed affected partners of the discrepancy, fixed the error, and issued refunds for over billing on video ad campaigns that ran between November 7 and December 12. “Given this was a technical error, not a policy or definition issue,” Twitter states that it’s “confident that [the issue] has been resolved” and will continue to monitor its systems for any future errors. Facebook Live Updates Mentions App: Facebook Mentions app, which enables public figures like athletes, musicians, journalists, politicians, and others to easily connect with their audience on Facebook, is adding several new live broadcasting features including live video drafts and reminders, comment moderation tools, replay trimming, and other adjustment tools. These new features are rolling out “in the coming weeks” and will be available to all Mentions users. Facebook Mentions is adding several new Live broadcasting features such as drafts and reminders, comment moderation tools, replay trimming, and other adjustment tools. Facebook Rolls Out Colored Backgrounds on Text Status Updates: Facebook rolled out a new feature that “lets users select a color that appears behind their text status in place of the normally-white background.” There are several options for colors including some with “an Instagram logo-style color gradient” for a “more stylish and modern” look for your Facebook updates. TechCrunch reports that colored status backgrounds are “rolling out globally over the next few days.” Currently, only Android users will be able to create them, but all iOS, Android, and web users will be able to see them in the news feed. Facebook Releases Guide for Page Moderation and Management: Facebook Business published a quick guide for page owners and admins that “includes tips… on how to report, block and prevent abusive activity, respond and manage comments and moderate and post important content.” In this resource, Facebook provides an overview of the tools and features currently available for page managers and offers advice on how to best manage your business page interactions and presence on Facebook. Facebook Business published a guide with tips on how to report, block, and prevent abusive activity; respond to and manage comments; and share important content on your page.